A ring fit for a Princess. 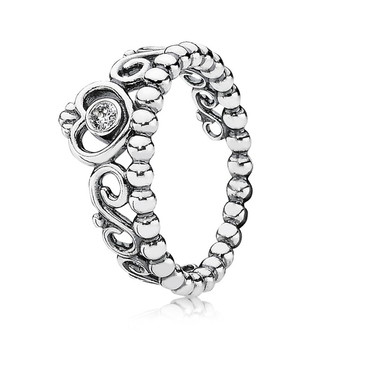 Make this romantic regal ring the crowning glory among your PANDORA collection. Try stacking with a combination of rose gold and silver PANDORA rings for an on trend mixed metal statement. I love this Pandora ring and was after it for a while. The service was extremely quick. I accidentally ordered the ring twice (due to a internet fault) however Argento quickly sorted this for me. The free P&P is a massive plus! Will definitely order again.... I also have the earrings to match this ring, they are gorgeous too! My wife is a Pandora and Princess fanatic, so when Pandora released a fairytale line she was obviously very excited. This ring doesn't disappoint, it looks fantastic and my other half is very pleased with it. Thank you Argento for a prompt and friendly service. Difficult to get hold of after Christmas but luckily in stock at Argento. Arrived perfectly packaged within a few days and with free delivery. My daughter loves it. Will certainly try Argento again. Ordered this as present for my niece and she loved it. Service was great and arrived within a couple of days. Excellent service from. Argento, quick delivery. Excellent product which was wrapped in original packaging and the tag I requested was written perfectly - thank you. Purchased this ring from Argento website, free P&P, excellent service. Packaging was very secure and the ring arrived when expected. ive bought this ring for my daughter for xmas i think its beautiful and im sure she will think so to i will certainly buy more in the future. Bought as a gift , fast delivery and perfect fit. Liked it so much I bought the rose coloured ring also. Bought as a 16th birthday present - recipient delighted with it and put on straight away! Bought as a valentines gift. The recipient loved it! Will definitely use Argento again! Hello Argento. My grandad will buy this ring, but we are away on holiday and not near our home address. Could you send it to our holiday address in the UK? Argento Replies: Unfortunately not. However, we can hold it for you until you return home. If you would like us to do this, please contact customer services on 08453664224 immediately on placing the order so we can action this. Hi, I'm just wondering if I came into the store would somebody help me figure out my ring size as the ones i own are a little too big and i dont know my size. And how much it would cost if they would.